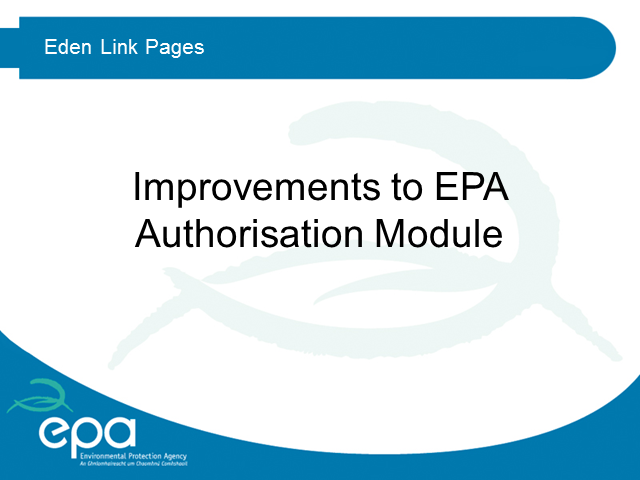 The EPA is implementing a number of design and functional changes to the Authorisation Module in the EDEN portal. These improvements will enhance the user interface and experience of licence and notification management in the Authorisation Module. This webinar will demonstrate these changes and allow you to ask questions in advance of the release of these improvements. This webinar will provide a general update to EPA licensee's in relation to air emissions assessment and compliance, covering topics such as recent publications and upcoming guidance, common air emissions compliance issues, enforcement priorities and statistics on compliance levels, and will also provide licensees with an opportunity to ask questions in relation to this area. The webinar is scheduled to run for a maximum of 45 minutes and will provide a broad update on this topic area. The EPA has prepared guidance for licensees on the preparation of accident prevention and emergency response procedures. The purpose of the document is to set out the minimum requirements of the Environmental Protection Agency for Accident Prevention Procedures (APP), Emergency Response Procedures (ERP), and their linkage to incident notification. This webinar will provide an overview of the guidance document. This webinar will provide details of the OEE’s new public access to information initiative whereby additional selected “Keystone Enforcement Documents” will be made available on the Licence Details page of the EPA’s website, www.epa.ie alongside the Annual Environmental Report. These documents include EPA Site Visit Reports and Licensee Self-Monitoring Reports. This webinar will provide an overview of a recently published EPA Guideline Template Report for reporting compliance with the Environmental Objectives (Groundwater) Regulations 2010 (S.I. No 9 of 2010) at EPA Licensed Sites. The target audience will be operators whose licences have been amended or reviewed with a condition requiring a Hydrogeological Review/Technical Assessment to be carried out in accordance with the EPA’s Guidance on the Authorisation of Discharges to Groundwater (2011). The webinar will discuss the stages of the assessment that are outlined in the template report. There will be time for questions as part of this webinar. This webinar will provide an overview of the 2014 EPA Guidance on assessing and costing environmental liabilities. It is relevant to EPA licensees with licence conditions requiring environmental liability risk assessments (ELRA) and closure plans (e.g. closure, restoration and aftercare management plans, residuals management plans and decommissioning management plans), and to applicants for new licences or licence transfers. The webinar will not cover financial provision, which will be the subject of separate guidance by the EPA. This webinar will be a brief informative webinar following on from the previous 'Air Emissions Monitoring and Management' webinar presented in September 2013. The webinar will provide an update on the findings from EPA monitoring of licensee emissions as well as a summary of 2013 licensee self-reported data through the ALDER/EDEN system (e.g. air incidents, compliance investigations, complaints, etc..). The webinar will also briefly cover some of the findings in relation to air emissions from the most recent PRTR report, details on updates to the EPA AG2 Air Emissions Monitoring Guidance and upcoming legislation changes. The first part of the webinar will provide background and practical information aimed at those who may be carrying out newly prescribed activities under the Industrial Emissions Directive. This will include details on legislative timeframes for new activities under the Directive and the implications of those timeframes for new applicants; where to direct queries; where to find information on how to make an application and links to resource material including legislation. -The importance of BREF and of BAT conclusion documents. The Annual Environmental Report (AER) is a requirement for all EPA licensed facilities. The Environmental Protection Agency is currently standardising the content of the AER to collect only relevant, interpreted data from the licensees using a series of templates which should give a concise summary of the environmental performance of the site for the previous reporting year as well as a record of on-going improvements for IPPC and Waste licensed facilities. The PRTR Emissions Reporting Workbook records releases of pollutants and off-site transfers of waste by facilities operating in relevant industrial sectors and is reported to the EPA on an annual basis via the sector specific PRTR Emissions Reporting Workbook. This Webinar is intended to assist licensees in completing the AER templates and PRTR workbook returns for this reporting year. This webinar will provide an overview of recently published EPA Guidance on the Management of Contaminated Land and Groundwater at EPA Licensed Sites and associated Guideline Template Reports. The webinar will discuss the stages of the risk based methodology, conceptual site models, use of generic assessment criteria and risk assessment tools. There will be time for questions as part of this webinar. This webinar will present information on best practice in relation to the managment of storm water (rain water runoff) at your site, including review of guidance on the the setting of trigger levels for storm water discharges. There will be time for questions as part of this webinar. This webinar will review minimum EPA requirements and best practice for assessment and reporting on the integrity of retaining structures such as bunds (tank bunds, pallet bunds, bunded drum storage, etc..) and effluent pipelines and identify common areas where improvements can be made. The EPA would also welcome questions as part of this webinar and time will be allowed at the end of the webinar for this. This webinar will provide licensees with information and guidance in relation to the preparation of emergency response plans and also their implementation. This year the EPA has been reviewing emergency response procedures as part of many of our site visits and this webinar will identify general areas where improvements can be made in emergency response planning. The webinar will also cover accident prevention and Agency guidance on the management and notification of incidents. There will be an opportunity to take and answer your questions as part of this webinar. This webinar will provide an overview of the minimum requirements for sampling of various types of water (storm water, waste water, groundwater) including sample preparation, storage and transport. The webinar will also address requirements for in-house and external laboratory analysis. There will be an opportunity to take and answer your questions as part of this webinar. This webcast will provide information on EPA requirements for monitoring of air emissions from licensed activities, including information on upcoming changes in requirements from 2014, as well as summary details from EPA monitoring contracts from 2012. There will be an opportunity to answer any questions as part of this webinar. This channel presents webcasts for EPA licence holders in relation to compliance with their licences and other useful information from the EPA.